Sony has launched the SmartWatch 2, an update of its Android-based watch, while the competition still seems largely to be in development mode. The company is also hoping to attract users that want a smartphone with a really big screen with the 6.4-inch Xperia Z Ultra. Smart watches have been in the spotlight recently, with reports that Apple, Google and Samsung are all working on products. But Sony is already offering a third-generation device in this category with the SmartWatch 2, the company said on Tuesday at the Mobile Asia Expo in Shanghai. The SmartWatch 2’s water- and dust-resistant body is made of aluminium and has integrated support for NFC. The watch has a 1.6-inch screen with 220 x 176 pixel resolution, a slight improvement over the previous SmartWatch, which had a 1.3-inch screen with a 128 x 128 pixel resolution, and Sony also promises improved battery life. The SmartWatch was preceded by the Sony Ericsson LiveView, which the company described as a wearable wireless micro-display. Sony pitches the SmartWatch 2 as a second screen for Android-based smartphones. Compatibility has been improved over the previous generation, and the device should be compatible with most smartphones based on Google’s OS, according to Sony. It serves as a multi-functional watch, Android app interface and phone remote control. On the screen users can read email, text messages and calendar reminders. It is also integrated with social networks such as Facebook and Twitter. A new SDK will soon be available for app developers, with added support and new features for the SmartWatch 2. The SmartWatch 2 will start shipping in September, Sony said, without elaborating on price. Recently, Sony launched the Open SmartWatch Project, which will make it possible for developers to create and install alternative software on the already-released SmartWatch. Sony didn’t say whether the SmartWatch 2 will become part of the program. While the SmartWatch 2 has one of the smallest screens available on a mobile device, the Xperia Z Ultra has the largest Full HD smartphone display at 6.4 inches, according to Sony. The waterproof LTE smartphone is powered by Qualcomm’s Snapdragon 800 quad-core processor at 2.2 GHz. There is also an 8-megapixel camera with HDR for videos and photos. The device is 6.5 millimeters thick and weighs 212 grams. It will compete with products from the likes of Huawei, Asus and last but not least Samsung Electronics. Just like with Samsung’s Note products, users can write and sketch on the Xperia Z Ultra’s screen. 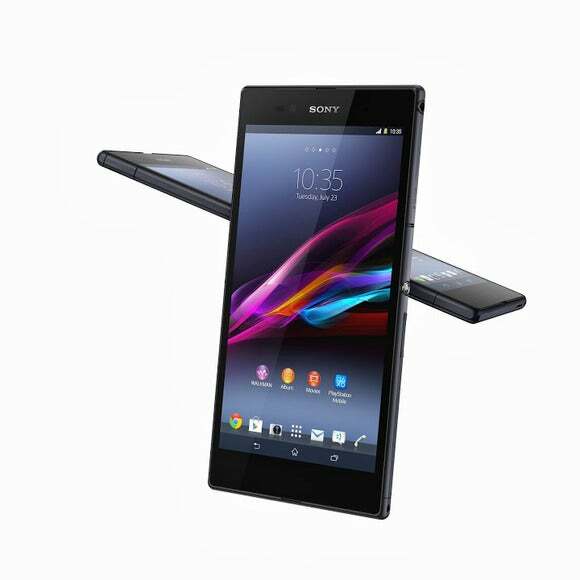 The Xperia Z Ultra will be available globally during the third quarter, although the exact timing of availability will vary by market, Sony said without elaborating. Again, the company didn’t say what the device is expected to cost.